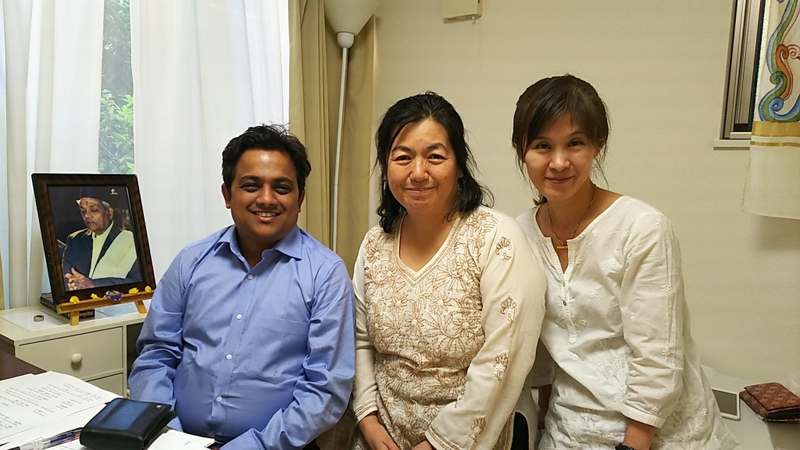 I have been learning Ayurveda in Osaka and Tokyo from wonderful Ayurveda Doctor, Sukumar Sardeshmukh sir. I barely could follow his high leveled lectures because of Ms. Sato Makiko’s meticulous consideration which was proper supplementary explanation for Dr.’s lecture contents. Up till now, many Ayurveda doctors could teach me Ayurveda nicely even I was a totally beginner of Ayurveda. Especially Dr. Jagdish Bhutada and Dr. Gururaj from Kaivalyadhama Yoga Institute, and many doctors from Gujarat Ayurveda University have shared their knowledge and experiences unstintedly. I’d like to say thank you for those of excellent doctors in India! Any medical practice and any ways to know human beings are not simple. There are many warps and wefts. Now I start to unravel these complicated vast fabrics through Ayurveda and Yoga with joy. And Tiwariji recommended me to attend 3 months course of Ayurveda for foreign medical practitioners at Gujarat Ayurveda university for the purpose to deepen understanding of yoga more, and I followed his idea. Now, I can understand what he meant. I’m very grateful to have the opportunity to learn from Dr. Sukumar Sardeshmukh this time. And I appreciate Ms. Makiko Sato’s all effort.